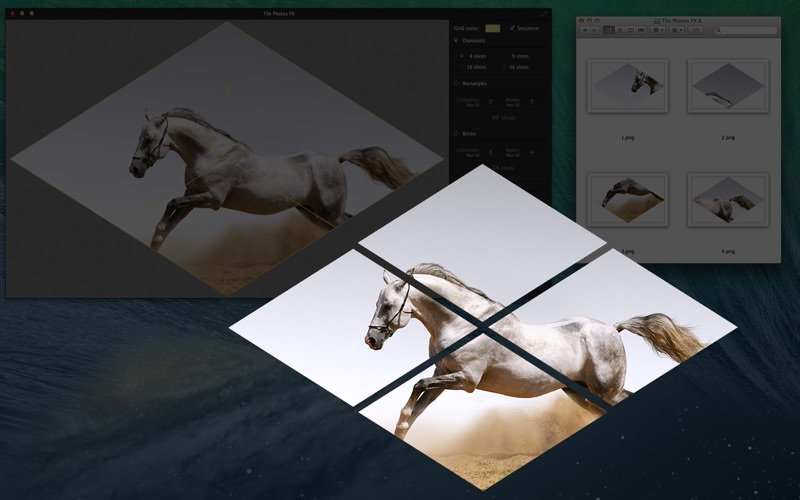 - Slice images into rectangular, triangular, diamond and brick-layout shapes. - Split huge photos or posters and print them in the original size even on your home printer. - Print sliced images with dotted lines and cut them by hand. - Choose custom number of slices. 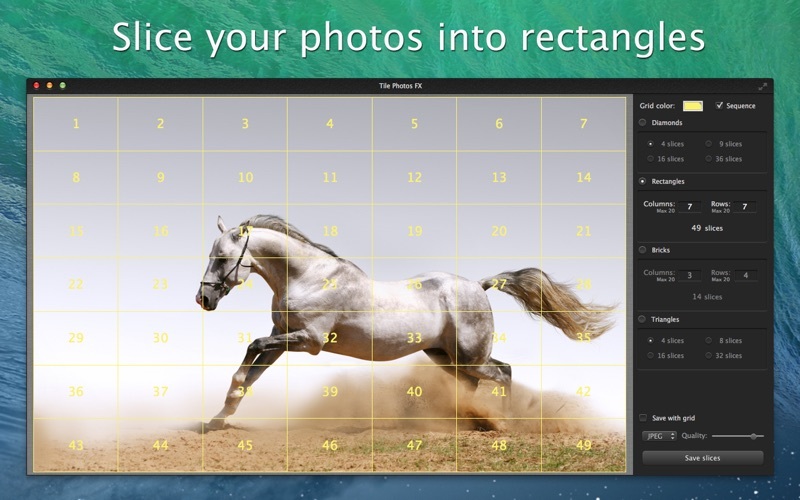 The App supports up to 410 slices of one picture. 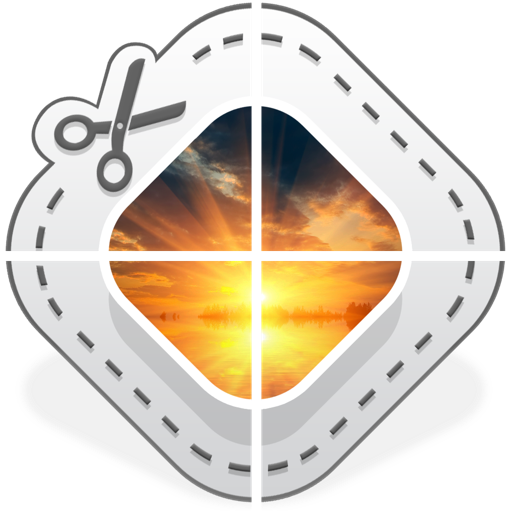 - View and slice pictures in a Full Screen mode. - Save slices in numerical order for the quick search of the particular slice. Tile Photos FX simplifies the process of slicing your images and helps to incorporate slices into web pages, Keynote presentations, Pages documents and other projects. Slicing is also particularly useful for webpage layouts that include such elements as buttons, logos, menu elements and other objects. Pieces of a large picture incorporated into a website load much faster than the whole image. 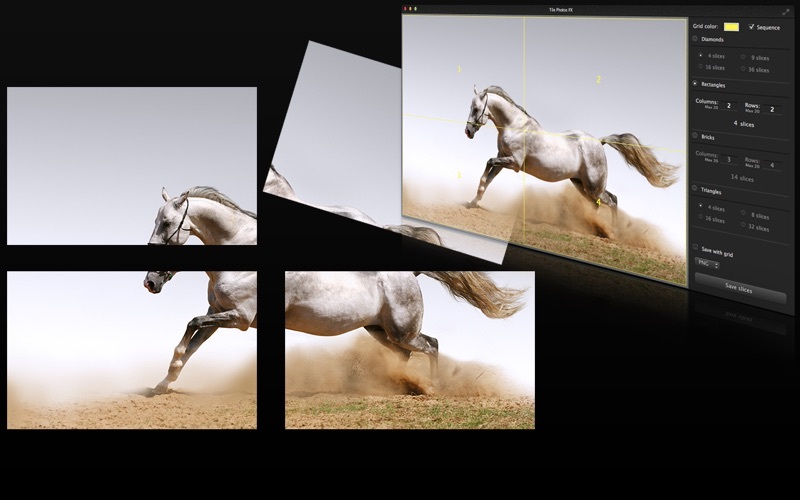 Furthermore, Tile Photos FX will help you to split huge photos, posters, charts or maps into several slices and print them in the original size even on your home printer. Advertisers, designers and photographers will highly appreciate the possibility to print individual slices of a huge photo or poster. The application also provides an additional option to print sliced pictures with dotted lines, so you could cut them by hand. Manually sliced pictures provide some great material for photo collages and other graphic work on paper or canvas. - Enhanced for the retina display. - More convenient saving with grid.